Legendary heavy metal band Metallica is making its entire catalog of music, spanning 30 years, available on Spotify, the band and digital music service jointly announced Thursday at an event in New York. Fans can now head over to Spotify to stream music from every Metallica album including Kill 'Em All,Master of Puppets, Metallica (The Black Album),…And Justice for All, among others. Metallica isn't exactly known for embracing digital music services in the past. The band in 2000 filed a $10 million lawsuit against Napster, accusing the file-sharing network of copyright infringement. 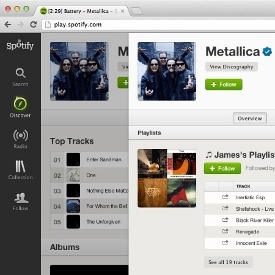 But it appears that Metallica has now has made up with Napster, whose co-founder Sean Parker is a Spotify investor. Parker joined Metallica drummer Lars Ulrich and Spotify founder and CEO Daniel Ek on stage for the announcement today. As a sure sign that the feud is in the past, Ulrich and Parker reportedly hugged it out on stage. "Metallica has always tried to be in control of the way we present our music to our fans, which is why we've waited to see the way these online retailers and streaming services operate and gauge the overall fan experience before deciding to include our music," Ulrich said in a statement. "We now feel that Spotify not only has a proven track record, but is by far the best music streaming service. We are beyond psyched to unleash our music through their platform." Spotify's Ek was also excited about the news, calling Metallica "one of the most influential and successful bands in history." "I learned to play electric guitar by listening to 'Enter Sandman' and my hope is that a new generation of fans will find the same connection to this amazing music through Spotify," he said. Meanwhile, Spotify on Thursday also took the lid off a major update for its desktop, mobile, and Web player platforms. The update will bring all-new follow and discover tabs for helping users find new music. "Users tell us they don't know what to listen to, and artists tell us they want to connect more closely with fans" Spotify's Ek said in a statement. "So we're creating a new and personalised way of finding great music." The new follow tab will allow users to follow friends, artists, influencers, and media to get updated about what they're listening to in real-time. Users will be able to follow hundreds of celebrities and media outlets, including Barack Obama, Katy Perry, and People Magazine to find out what they're listening to. In addition, the new discover tab (below) offers up content a user might like. The page will include new releases from a user's favorite artists, along with music and playlists shared by influencers to whom they subscribe. It will also leverage a user's listening history to offer up other recommendations, including music, reviews, and concerts. The latest version will also introduce push notifications for new album releases, a more curated social feed, more personalised profile pages, and redesigned artist pages. In addition, users will be able to preview songs without having to navigate away from track currently playing, and save music without having to create a playlist. The new follow feature will be available "in the coming weeks" as part of an update to the Spotify desktop app. A full cross-platform upgrade is slated to arrive next year.